The Saltmarsh for Life Committee commissioned Dr Jon Knight to undertake a review of Saltmarsh Rehabilitation Techniques utilised in Queensland and New South Wales. Dr Knight found over 100 projects throughout the two states, from which he identified effective rehabilitation techniques that can be applied in the South East Queensland region. This project was funded by Gold Coast Waterways Authority, Redland City Council, Moreton Bay Regional Council and Gold Coast City Council, and coordinated by Healthy Land and Water. The above study found that the following Manuals are applicable to South East Queensland. It is recommend these be considered when undertaking Saltmarsh restoration projects in South East Queensland. Saltwater Wetlands Rehabilitation Manual produced by the Department of Environment and Climate Change NSW (Anon 2008). 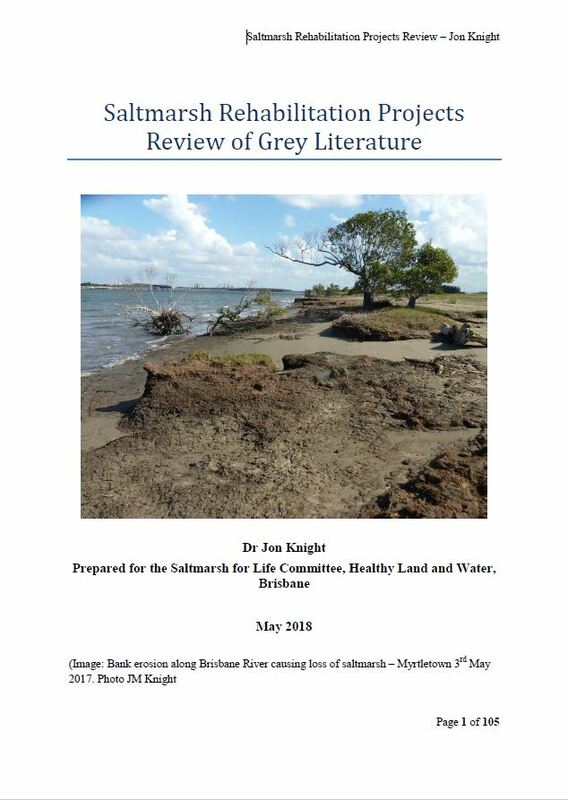 This is supported by the paper by Kerryn Stephens – Saltwater Wetlands – a Guide to Rehabilitation (Stephens 2007). Wet eBook: Workbook for Managing Urban Wetlands in Australia. Produced by the Sydney Olympic Park Authority (Paul 2013). The Waterwatch Estuary Field Manual (Anon 2010) provides some strategies for monitoring saltmarshes as does the Methods Manual Saltmarsh Habitat produced by Mangrove Watch. Issues around evaluating connectivity in aquatic ecosystems, including saltmarshes, are explored in “Framework for evaluating aquatic ecosystem connectivity” (Department of Environment and Heritage Protection 2012). The framework helps to place rehabilitation at the site scale into the context of the broader mosaic of wetlands helping to provide a strategic overview to resource use and funding.